Card Review: 9.7 Initially I was disappointed with this card. My father was so impressed with these "new" cards that he went out and bought my brother and I an entire box, something he never did. We tore through it and didn't pull a single Wallach. The photography in this set was pretty cool, with some really unique shots. Based on what I was seeing, I had really high hopes for the Wallach. So my initial reaction upon pulling this card was a bit of disappointment. However, it's grown on me over-time, and has actually become one of my favorite Wallach cards. But as an 9 year old, it was a bit of a let down. 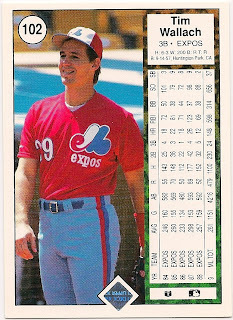 Like every other kid in the country, I was infatuated with Upper Deck in 1989. That infatuation did not last, and by the mid-90's I had all but stopped collecting cards. 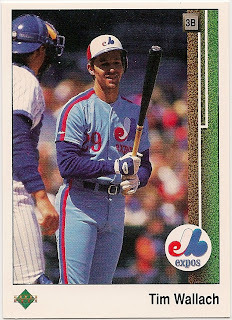 This had a lot to do with starting high school, but it also had a lot to do with what Upper Deck did to the traditional baseball card with it's introduction of the "premium" card. I still hate the glossy card, like the one's Topps does today. I'm sure they would have gone that direction eventually, but I can't help but think Upper Deck sped up the process. I hate Upper Deck. But there's no denying the historical significance of this set, and that as a whole is very nice looking one. This card was also the first Wallach card I ever obtained 9 copies of. This was important at the time, because back then I kept them all in 9 page sleeves in 3-ring binders. So this was the first card I was ever able to completely fill a page with.